Did you hear the news of last week? Obviously there’s a lot of stuff going on down here on Earth, but that’s now what I want to talk about here. Something else has happened, about 18 billion kilometres away. Right on the edge of the Solar System. Last week, NASA announced that their Voyager 1 space probe has entered interstellar space. This is the first man-made object to leave our Solar System! That is amazing news, not only for scientists and space enthusiasts. I’m very excited about what Voyager will discover – even though I’m not an astrophysicist and don’t know much about all that plasma and whatever else is around there. Some of you may not know what Voyager is, so here a short description: Voyager 1 is a spacecraft that was launched in 1977 to explore the outer Solar System. It passed by Jupiter in 1979 and Saturn in 1980, and after that the mission was extended to explore the outer regions and boundaries of the heliosphere – the region in space that is dominated by our Sun. It is still working and gathering data – although some parts have been shut down because the battery of course doesn’t have the initial power levels anymore. And the communication must be quite tricky: at that distance, it takes over 17 hours for a signal to arrive at the spacecraft, and of course another 17 hours for the answer to come back. 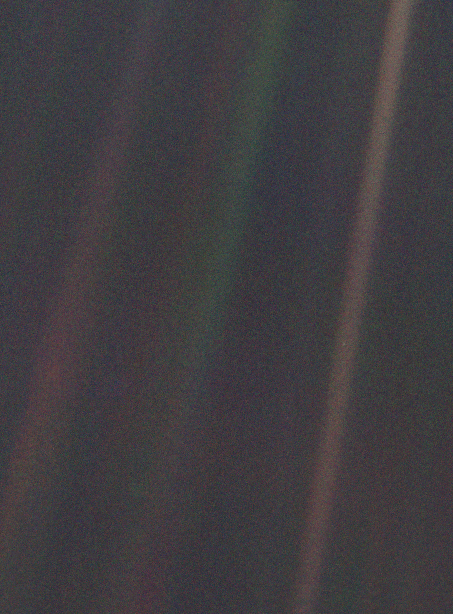 Among all the interesting data gathered by Voyager, one thing stands out: a photograph taken in 1990, titled Pale Blue Dot, which is the most distant picture of the Earth ever taken – at a distance of 6 billion kilometres. The Earth is barely visible in this picture taken by Voyager at a distance of 6 billion kilometres.